A bright side dish with peas and lemon, this creamy risotto cooks up quick and easy in the pressure cooker. The parmesan flavor goes well with pork, chicken, or seafood or as a springtime meatless main course. As the weather turns warmer I crave lighter foods. When evenings are still cool, however, having a nice warm side dish makes for a cozy meal. 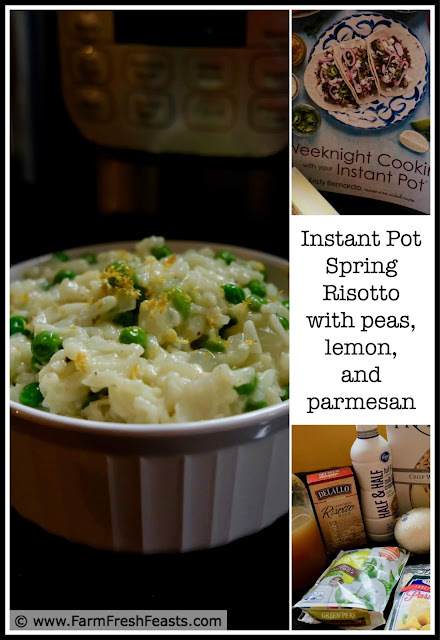 This Spring Risotto from Kristy Bernardo's cookbook Weeknight Cooking with your Instant Pot is perfect for this time of year. 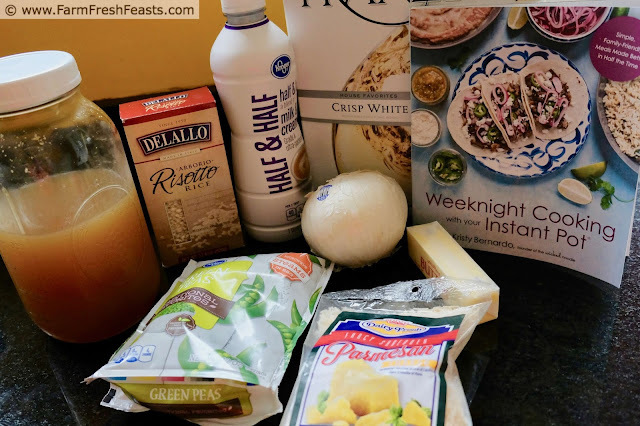 My spouse bought me an Instant Pot last summer, and I think it's a terrific tool to help me get a home-cooked meal on the table. I almost said "nutritious home-cooked meal" but if you've been here before (thanks for coming back!) you'll know my usual fare is nutritious home-cooked meals. I feel the IP is more than a gadget--the ease of making clear, beautiful chicken stock ahem chicken bone broth, dry beans to a meal in an hour, and easy to peel hard boiled eggs are big selling points--but it will not replace my rice cooker or my slow cooker. I don't think I'll ever throw dry spaghetti, sauce, and water into the IP. It's too easy to do on the stove top. Frozen meat? Maybe. We'll see. 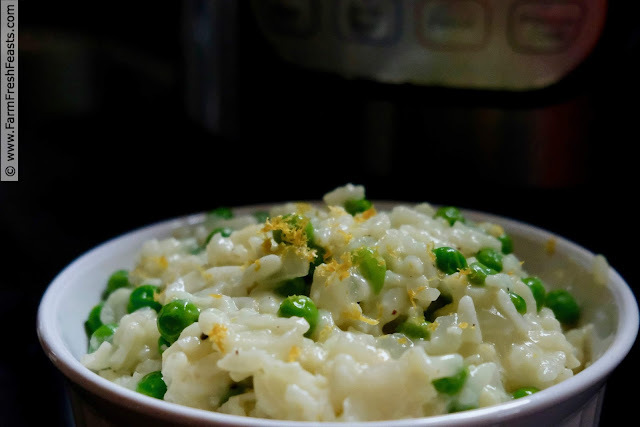 I hear tell that making risotto on the stovetop is difficult. I've never made it at home, but at work I have not found that to be the case. Sure, making risotto traditionally involves a bunch of stirring, but how else am I going to get my steps in? I took a class where I heard the sentiment 'multitasking is impossible'. I disagree. You may say I am "cooking", a single task, at work but what I'm going is monitoring one or two sauces/soups in different stages of preparation while timing pasta and plotting the uses of the shallots my hands are busy chopping. My mind is focused on multiple tasks and I call that multitasking. 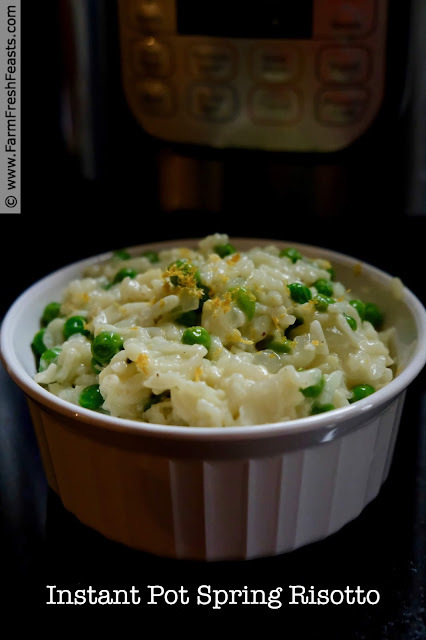 Back to risotto. Since I like to provide seasonally appropriate recipes, when I got a copy of Kristy's book I started looking for ones using Spring vegetables. 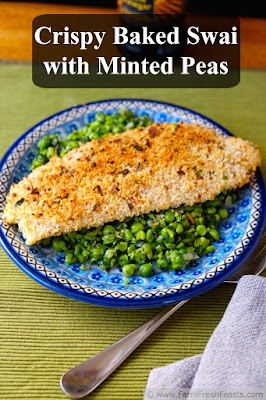 I think fresh peas, cut on the bias, would be terrific in this dish, but frozen worked just fine too. 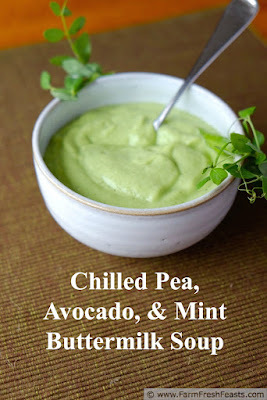 I plan to make this again when fresh peas cross my threshold, wherever that may be. A note to my regular readers: I've not fallen off the face of the earth! My house is on the market, and between getting it all ready and especially keeping it all ready for showings, for inspectors, for appraisers, for radon determiners (that's a thing, right?) cooking has really taken a back seat. When you spend 45 minutes cleaning the top of the stove you're less likely to want to mess it up again just because the kids don't want cereal for dinner. I've been cooking in binges, trying to use up pantry, freezer, and the Strategic Winter Squash Reserve before we move to join my spouse, and spending no time working on photos, videos, etc. I wanted to do Kristy's book justice, though, so with my constantly cleared off counters I set out to record this recipe and the one that follows, Instant Pot Dijon Pork Chops. One of the neat things about using the Instant Pot is the time you've got while the machine is doing something for you. As you can see in the video, I didn't prepare all the ingredients (chop the onion, measure the wine) first! Instead, while the pot is coming to HOT on the Sauté function, I am chopping the onion. While the onion is cooking, I am measuring out the rice. While the rice is cooking under pressure, I am zesting the lemon. You get the idea--just walk in the door and fire up the machine so you can take your time getting things ready while the Instant Pot is doing the work. I did not have heavy cream so I used half and half. It was fine. I also used a 12 ounce package of frozen peas, not the 9 ounces Kristy called for. A few extra peas never hurt anyone. 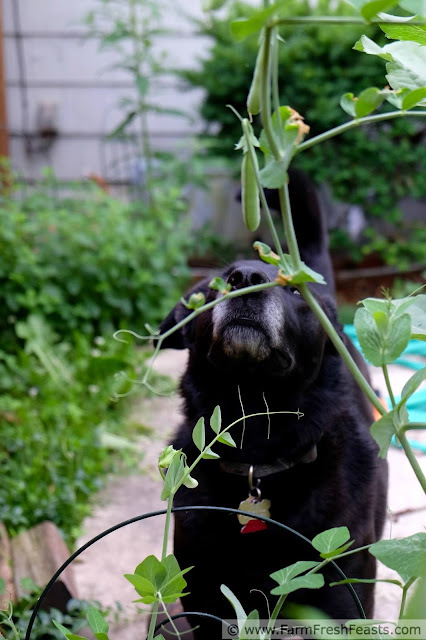 If you have fresh, local--your back yard or Community Supported Agriculture (CSA) farm share--peas that you'd eat pod & all I recommend chopping them up and tossing the whole thing in the IP. 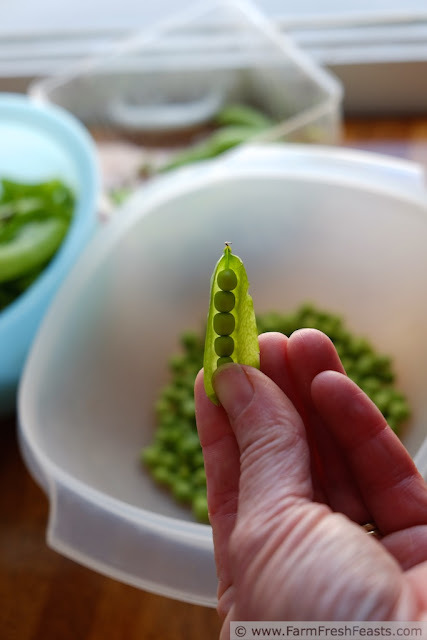 No need to shell fresh peas out of their tender young pea pods. Slice them on a diagonal to make it interesting. 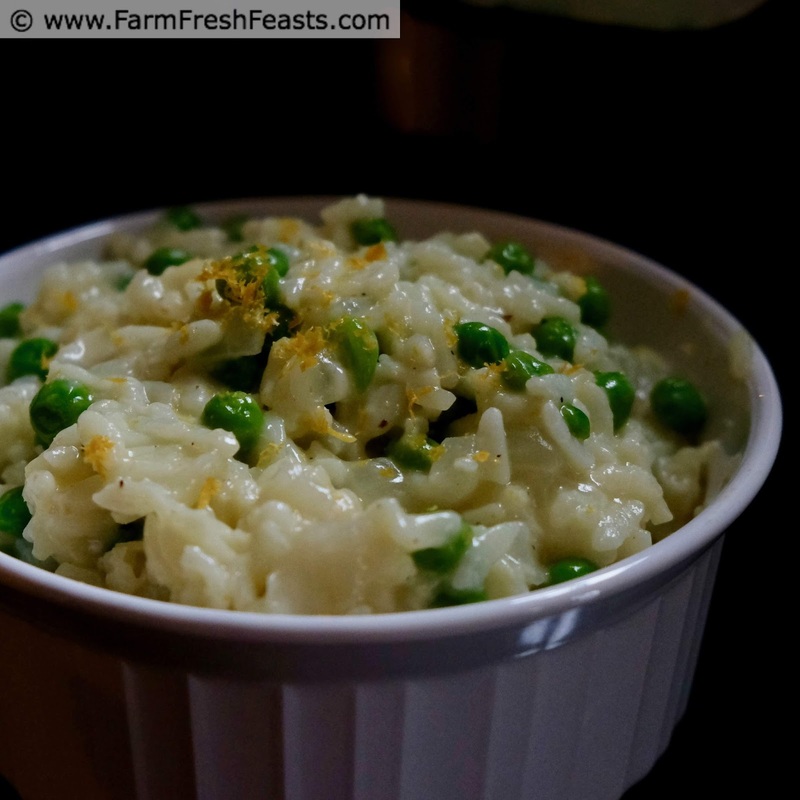 A bright side dish with peas and lemon, this creamy risotto cooks up quick and easy in the pressure cooker. The parmesan flavor goes well with pork, chicken, or seafood or as a springtime meatless main course. Cook time refers to under pressure cooking time. Total time refers to about how long it took me to prepare the dish. 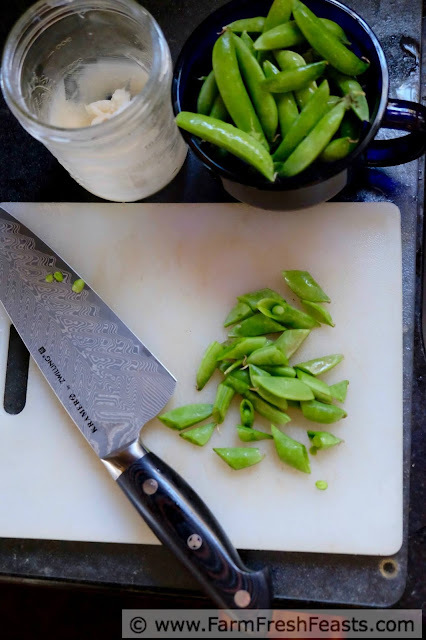 Press "Sauté" to preheat your Instant Pot. When the word "hot" appears on the display, add the olive oil, then the onions. Cook until the onions are opaque and softened, about 5 minutes. Add the garlic and rice and cook about another 3 minutes, stirring frequently. Pour in the white wine to deglaze the pot and allow most of it to evaporate. Press "Cancel" to turn off the Instant Pot. Pour the chicken stock into the instant pot, and close and lock the lid. Press "Manual" and adjust the timer to 6 minutes. Check that the cooking pressure is on "high" and that the release valve is set to "Sealing". When the time is up, open the Instant Pot using "Quick Pressure Release". 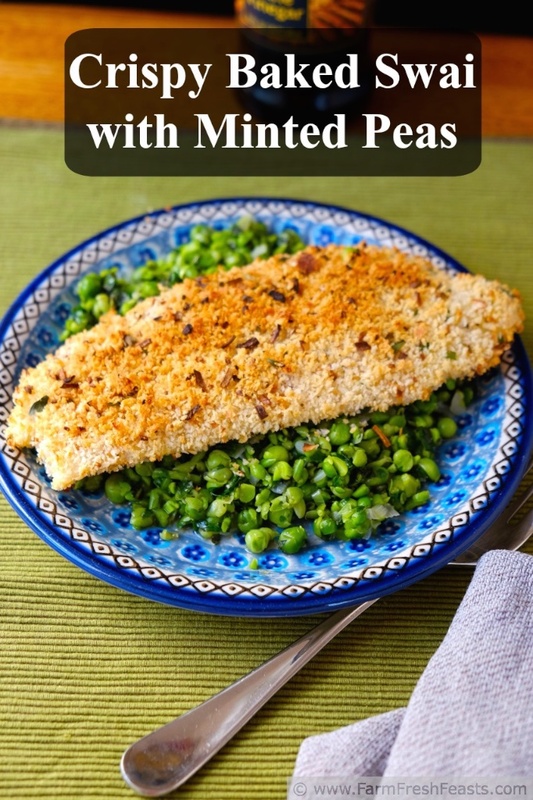 Stir in the butter, lemon juice, lemon zest, cream, and peas, then season well to taste with salt and pepper. If you like pepper, go a little heavy here; it works well in this dish. Top with the Parmesan.